Last Sunday at the Ideal Home Show saw the live final of the Ideal DIY Dad of the Year, hosted by DIY Doctor at the How To Theatre. Any Dads, Step Dads, Uncles or Grandads visiting the show could enter by answering a twenty question quiz, with the three top scorers going through to the live final on stage. The three finalists – Duncan Devine, Peter King and Roy Jones, then had to show their DIY skills competing on three practical DIY tasks, firstly to test their decorating skills by ‘cutting in’ around the Ideal Home Show logo, then sawing a piece of timber with absolute precision, and finally tiling around a bath. 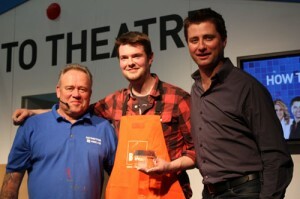 The whole event was overseen by ‘DIY Doctor’ Mike Edwards, along with architect and TV presenter George Clarke. The overall winner of the competition was Peter King, pictured left with Mike and George, who now holds the title ‘Ideal DIY Dad of the Year’ for 2011!